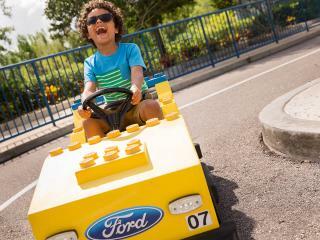 The LEGOLAND® Florida Resort One Day Ticket gives you a full day's admission to LEGOLAND® Florida Resort. The ticket does not include admission to the LEGOLAND Water Park. LEGOLAND® Florida Resort is situated in Winter Haven, a simple 40-minute drive south of the Orlando theme parks. Yes, we are currently running a FREE ROUNDTRIP TRANSPORTATION Special Offer with LEGOLAND® Florida Resort Ticket purchases. The LEGOLAND® Florida Resort Shuttle Bus runs from I-Drive 360, 8401 International Drive, Orlando, Florida 32819. The shuttle pick-up is outside the car park near the back entrance of the Icon Orlando on the Universal Boulevard side of the property.